Great to see that our program is receiving lots of media attention! This article appeared in Quest Newspapers/Courier Mail 3/2/15. A mother-of-three has delivered a world-first for caesarean birth by combining childbirth education with hypnosis. The Positive Caesarean Birth childbirth education program created by Paddington childbirth education expert Melissa Spilsted has recently been made available nationwide. Mrs Spilsted said considering about 30 per cent of births in Australia are now via C-section, the program had the potential to positively impact on many lives. Mrs Splisted said forms of anaesthesia were still required in Caesarian births however her focus was calming the mind and body before giving birth. 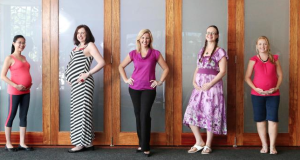 Hypnobirthing Australia has practitioners in Brisbane and Ipswich. The program incorporates education and the use of hypnotherapy to prepare parents for a positive and empowering birth experience. “Our standard hypnobirthing course focuses on natural birthing however we all know that there are times when the safest delivery for mother and baby is via caesarean section.,” she said. “Studies have shown that when self-hypnosis used in conjunction with surgery, it can reduce the perception of pain, level of post-surgery medication required and also the length of recovery. Royal Australian and New Zealand College of Obstetricians and Gynaecologists Associate Professor Stephen Robson vice-president (Women’s Health) said the use of hypnosis techniques was not new, but despite its very common use, there was little objective evidence to show benefit. “There are still only a small number of studies assessing the use of hypnosis for labour and childbirth,” he said. “Although the intervention shows some promise, further research is needed before recommendations can be made regarding its clinical usefulness for pain management in maternity care. “Obstetricians are very keen to explore and adopt any techniques that benefit women. “Unfortunately, at the moment there is little evidence to back up claims for hypnosis. Mrs Splisted said when parents are armed with knowledge, good support, a positive mindset and tools (breathing, relaxation, self-hypnosis) to remain calm — this can equate to a more positive and empowering birthing experience. She said during hypnosis, the body relaxes and thoughts become more focused. “Hypnosis lowers blood pressure and heart rate and changes certain types of brainwave activity,” she said. The ‘Positive Caesarean Course’ is a private four hour course which is suited to mums who know that they will be requiring a caesarean section and which to prepare for a very calm and joyous birth.